Date Night just got back from six weeks in Europe, most of it in France. The Europeans have their own style of cooking meat, and although the presentation is beautiful, the meat in the United States is much better. In France, they like to cook their chicken and pork on the electric rotisserie, which we bet is a French word. It’s good, but it’s not American BBQ. 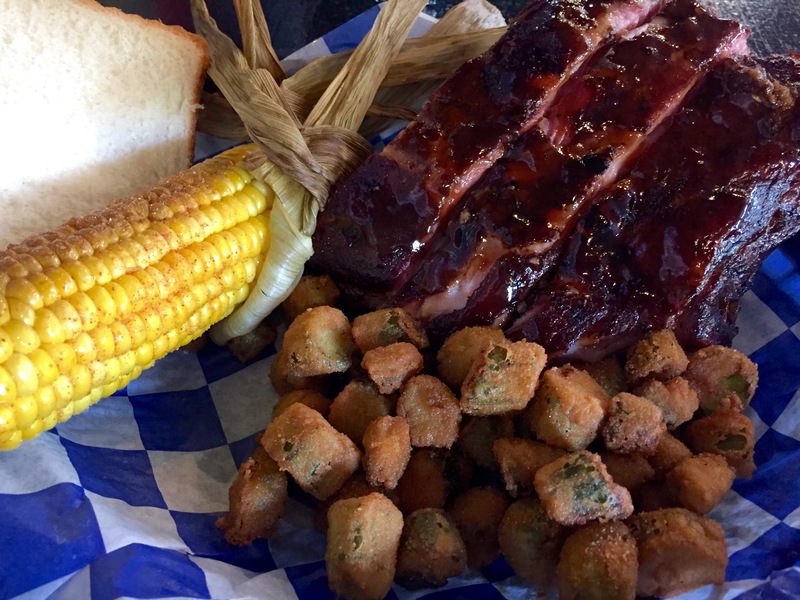 When we return to the United States, Eve takes off to visit friends in New Hampshire, and I take off to three BBQ restaurants in Roswell for ribs. Who will win the Roswell Rib Roundup? Barbecue connoisseur (another French word!) Grant Goggans over at Marie Let’s Eat has visited over 300 BBQ joints in the southeast and is certainly an expert on the subject. He judges a place by their pulled pork. Here at Date Night, we judge a joint by their ribs. 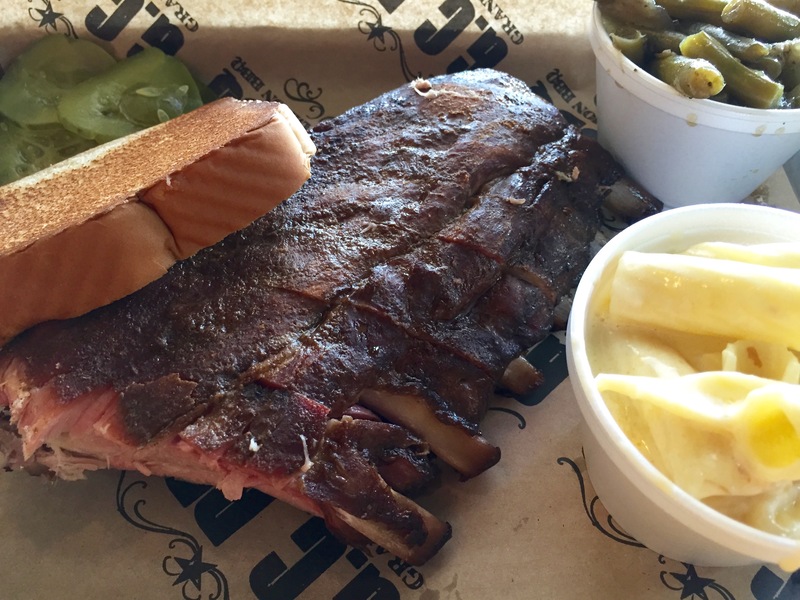 As my cholesterol count rises, I visit three places known for ribs over a period of six days. I order ribs and two sides from each restaurant. I go during lunch, when I figure the ribs will be the freshest and have not been sitting around all day. Our contenders, picked because they are fairly close to each other, are Dreamland BBQ, Grand Champion BBQ, and Spiced Right Ribhouse. Let the rib roundup begin! 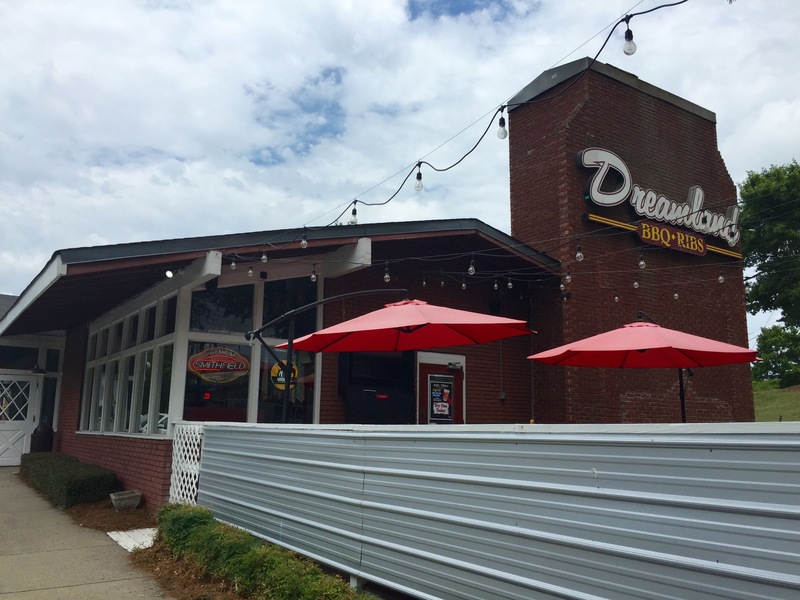 Dreamland has three restaurants in Alabama. They also have one in Roswell. They must do ribs because it’s right there on their sign. This place was a Western Steer/Sizzler back in the day. If you imagine real hard, you can still see the steaks sizzlin’ in the kitchen. 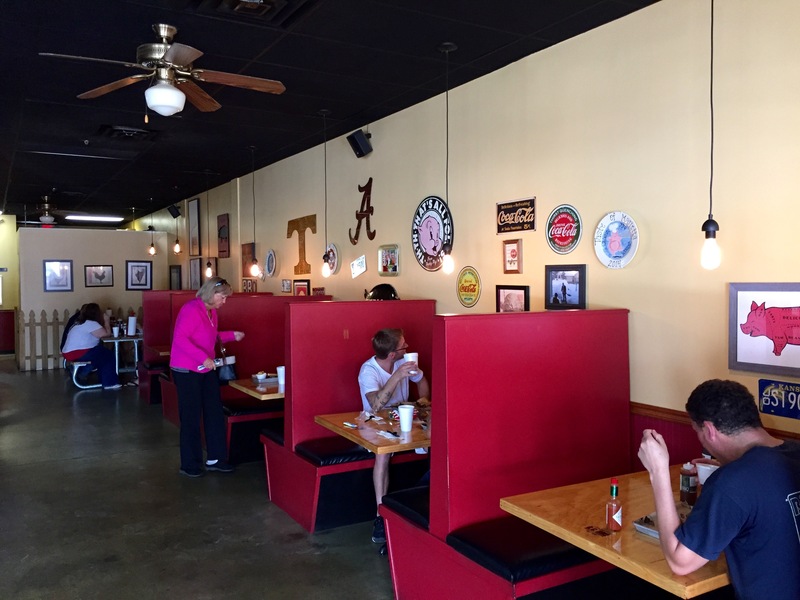 The decor is totally University of Alabama, which makes this Georgia fan a bit uncomfortable. There are lots of license plates and metal signs up on the walls, as well as pictures of some old guy in a houndstooth hat. The official Date Night photographer is out of town, and I forget to take a picture of the inside. I do remember to take a picture of my ribs. Everything on this plate ($12.95) is just OK. The ribs are adequate, but nothing that I would have to go back for. The mac and cheese tastes like it’s from a mix and the cole slaw is pretty bland. The most impressive thing about Dreamland is the service, which is very fast and friendly. I leave full, but a little disappointed with the food. This building used to be a lush forest in East Cobb County. Now it’s just another one of those interminable strip shopping centers that start miles away on Johnson Ferry Road and end right here at Grand Champion. Technically, Grand Champion is in East Cobb, but their mailing address is Roswell (how does that happen? ), so we can include them in our roundup. The sign on the window says “award winning ribs and macaroni and cheese”. Carly Simon is singing “Anticipation” in my head. There are lot of pigs, tin signs, and yes, car license plates in the decor. The ribs here are baby back ribs, which make them more expensive at $16. It costs another 75 cents to add macaroni and cheese. Yes, I am worth it, but really? Now lunch is up to $16.75. At the recommendation of the nice girl at the counter, I get the green beans as my second side. 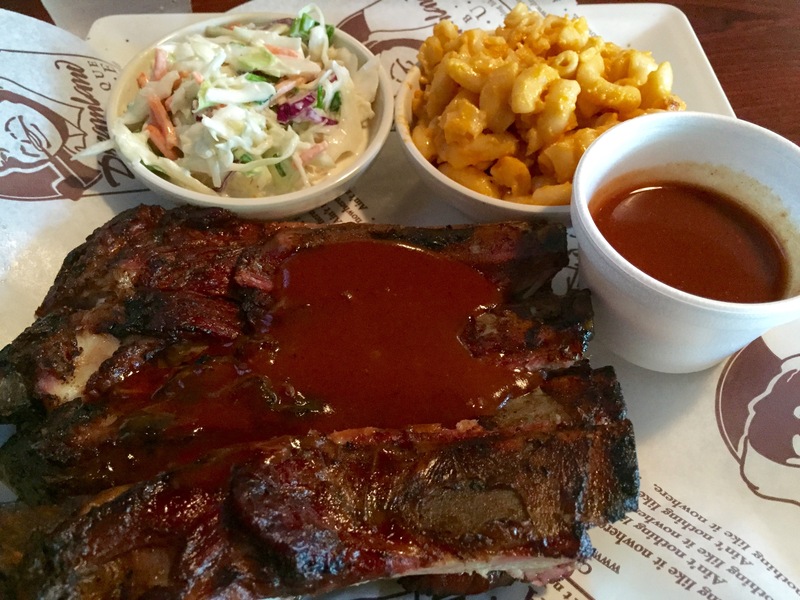 The ribs are served dry and you get to add your own sauce. I like that. There are two sauce choices, the house sauce and a Carolina sauce. I stick with the local sauce. The ribs are very good. I prefer regular ribs over baby back, but these have just the right amount of smoke and are not dried out. I can see why they win awards. The macaroni and cheese, however, is a disaster. It’s more like macaroni served in a cheese soup. It’s watery and I can’t believe this recipe ever won an award. Something is amiss and I want my 75 cents back. The green beans save the day. It doesn’t look like they use pork in them, so vegetarians will be very happy. However, I can’t imagine a vegetarian getting within three miles of this place. It would be interesting to research what this building used to be. Maybe it was a car dealership or gas station a long time ago. Spiced Right has been here for awhile, and every time I see the smoker blazing in the front, I want to stop for ribs. 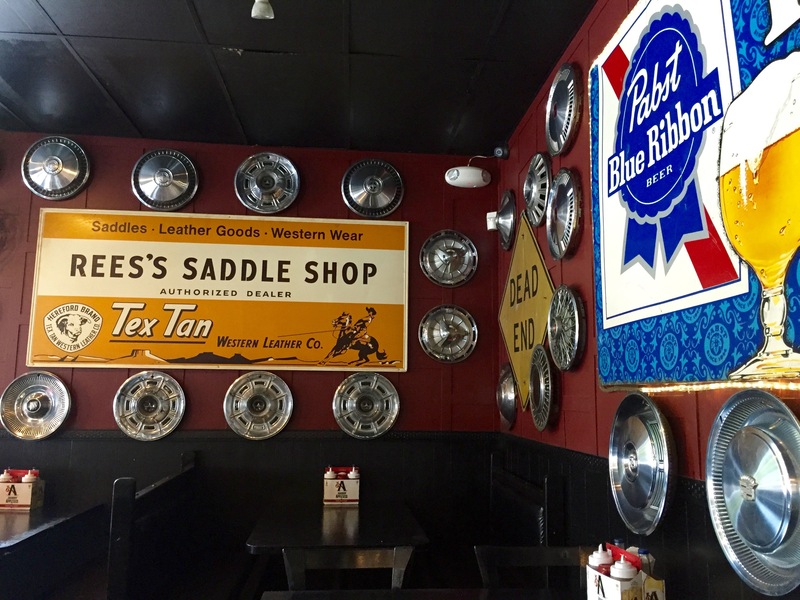 There must be an official “BBQ Joint Decorating Society” that has one rule: you must have car parts and metal signs as part of your decor. Spiced Right is just like the others. What is different is their ribs ($11.60). These are excellent bones, and the lowest-priced of our three meals. They are full of meat with just the right amount of fat. They are juicy and tender, but not overcooked so they still have a little texture when you bite into them. The corn is cooked in the husk on the smoker and might be one of the best pieces of corn this reporter has ever had. There is no mac and cheese on the menu, but if you are there during the summer and the corn is on the menu, order it. The fried okra is a stand-out as well. It is fresh, hot, and just came out of the fryer. Should have checked out Swallow in the Hollow. Colin: Saving “Swallow” for its own separate Date Night. Thanks for reading! Spiced Right building was never a gas station or car repair. It was an aluminum butler building. For a while it was a fabulous bread bakery . Thanks, Janet. I knew that somebody would know! 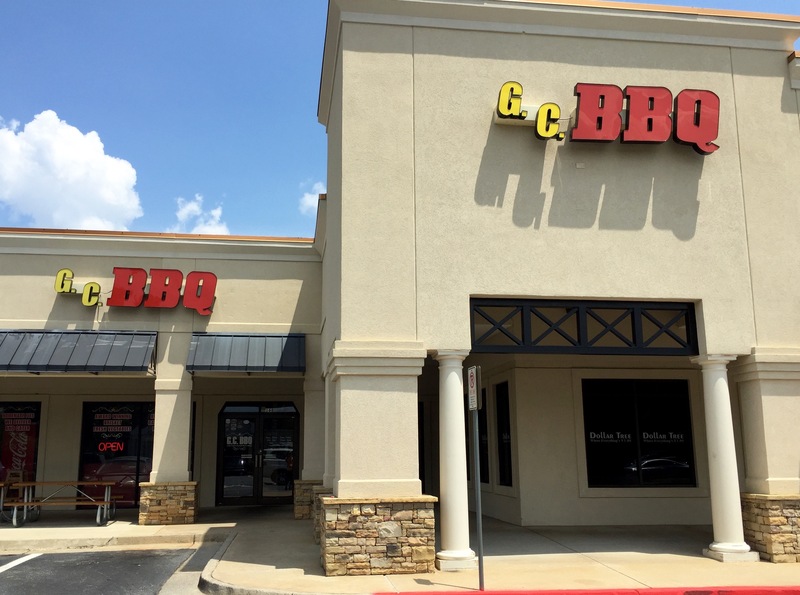 GC BBQ has a Roswell address because it’s mail is routed through the Roswell post office. It and all addresses like that are actually in Cobb County thus, not actually in the Roswell city limits. This was kind of an unspoken “trick” by real estate agents to convince someone to buy a home because it had the prestigious “Roswell” mailing address (but lower taxes). Lots of folks were angry when they found out they had to pay non-resident fees ( 50% extra) at Roswell Rec & Parks for programs for their kids. Thanks, Linda for the explanation. Sounds like you live in the area. Too bad they don’t know what real BBQ tastes like. If your ever in Wichita go to Pig In Pig out on E 13th. 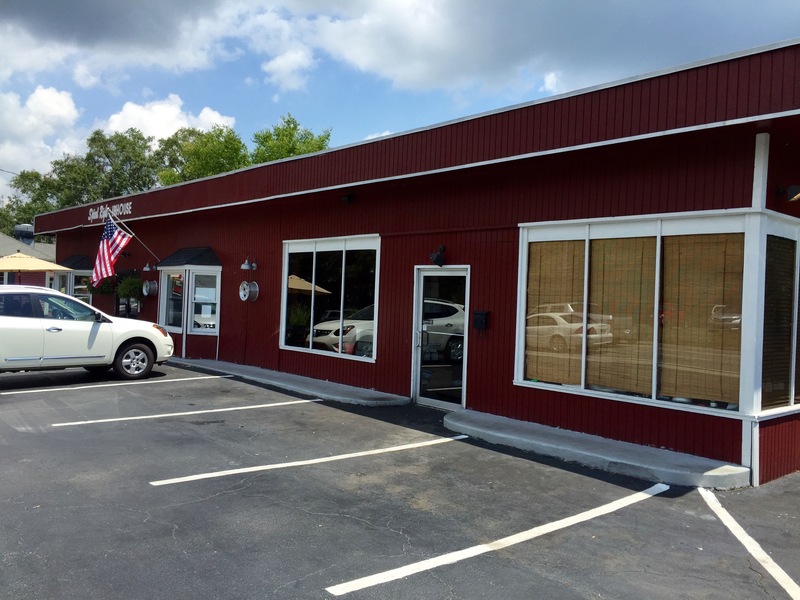 It’s also decorated as a BBQ restaurant should be…….ribbons from BBQ cook offs.